When I heard Alice Pung talking on radio about her life, she was so interesting and articulate and amusing that I knew I had to buy this, her latest book. However, the novel is an enigma to me. For a start, Black Inc is known for publishing only adult novels. So I don’t know where this book fits into its list. It’s not a typical YA novel, though the narrator, Lucy Lim, is aged fifteen and writing about her year as a scholarship student at a prestigious girls’ college. What the problem for me is the style and sophistication of the narrative. The writing is excellent; overall I enjoyed reading the book. But I’m curious to know what teenage reader would make of it. Lucy constantly addresses what seems to be a close friend, Linh. It was only towards the end of the story that I realised that Linh is Lucy's Chinese name. 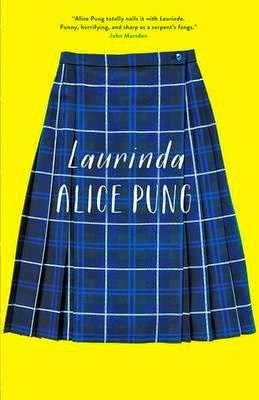 The whole of the novel is about Linh’s navigation -- and eventual transformation – from her working-class roots in Stanley (‘a place of bogans’ where people are generally poor) to Lucy who experiences learning (social more than academic) in a wealthy school where girls take their elevated status for granted. Lucy’s home life stands in stark contrast to that of the young women at Laurinda which appears to be dominated by what she calls ‘The Cabinet’. This trio of teenagers prove to be nasty and spiteful though giving the outward appearance of conforming. They appear to be an asset to the school and its principal, Mrs Grey ,who seems to be under their thrall -- enough to say that the trio’s mothers run the Alumnae Association and make massive donations to Laurinda. Throughout the book – and this is really at its heart – Lucy is constantly self-analysing and making judgments about this alien world in which she finds herself. She is quiet and truthful and tries to fly under the radar but the principal constantly sees her as not fulfilling her potential. At home she sees her parents struggling to put food on the table (eating meals from newspaper on the floor). Her mother runs an at-home business sewing clothes while Lucy is often left to care for her beloved little brother, The Lamb. All of this is at odds with what she sees at the prestigious Laurinda. Matters come to a head when The Cabinet traumatises a woman teacher they detest and later cast aspersions (in the form of sexual innuendos) on a caring and effective male teacher. Lucy, whom The Cabinet has pretended to befriend, removes herself from the group, but in the end she makes her feelings known publicly. Thus she sets in motion changes to the school ethos. I'm donating my copy to my library, so will ask some for you. We have some thoughtful and articulate students I can discuss this with. The average girl would recognise the Cabinet, but there isn't any romance in it as I recall, and they prefer that. It is, I think, a literary book. The author did say on radio that it wasn't based on her own experience, though her school does get a sort of mention in it(Lucy's original school). Many of my students have read and loved Unpolished Gem, because they are western suburbs kids themselves.